Best burger in town is a coveted title for any establishment devoted to flipping patties; and it's one that many pundits have granted to Danny's. Recent trends in burger franchising have tended toward the gourmet: their menus run the gauntlet from avocado to zitar. Danny's is the opposite in approach and the winner in value and flavour. Their burgers start with a good pattie, which after grilling still retains a mincey texture. Their basic burger is bun, pattie, lettuce and onion, and it's $4.50. Not much to fault there. Working down the menu lets you build a burger to take your fancy, adding bacon, cheese, tomato or an extra pattie or two. Even their works burger is only around $7.50, well shy of the $10 or so starting point of 'fancier' places. For me the winning element at Danny's is the buns, the insides of which are lightly toasted. I always like that extra crunch and it means the sauce, and cheese if you've asked for it, melts into the bread. Their chips, too, bring the crunch and are salty without being dehydrating. Having served Melbourne since 1945, Danny's retains a great retro interior, perfectly suited to burger, chips and an old-style bottle of soft drink. Oh HOOray! 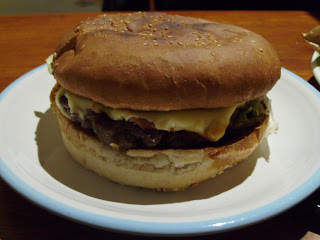 I love a decent no-nonsense well-made burger. There seems to be a real gap in the market between a cheap crap burger and an oh-my-god-you're-charging-me-HOW-much-for-this-burger burger. I'll have to try it some day! Hehe Pete, I like how you were balancing your diet!